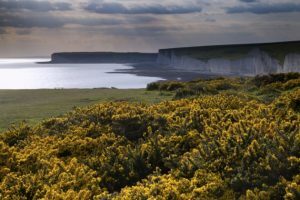 Eastbourne offers a great variety of holiday homes, holiday cottages and short term holiday lets. This southeast coast resort is popular with short breaks, family holidays as well as corporate lets all year round. Escape to one of our Eastbourne Holiday Homes in under two hours from London and explore the many exciting things it has to offer. This coastal town is thriving with history and perfect for a romantic weekend away or family break. On the seafront there is the 19th-century Eastbourne Pier, a picturesque 1930s bandstand as well as the famous Birling Gap and Seven Sister cliffs. 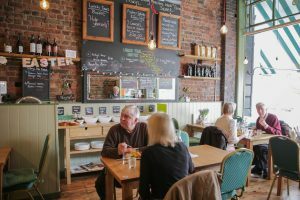 With fine dining restaurants to cosy pubs and plenty to do with children there really is something for everyone. Beautiful location with views as far as the eye can see on a clear day. Excellent visitor centre at the top and a pub for a swift coffee or tipple when staying in one of our Eastbourne Holiday Homes. Head towards the light house with some really striking views but please be careful near the edge. Walk, go rock-pooling or simply relax in the sun with views of the Seven Sister cliffs. You can pick up a tracker pack for strand line searches and fossil hunts from the visitor centre for children where there is also a café. 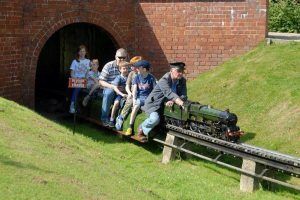 A great family day out where you can ride on trains around the park – if you are staying in one of our Eastbourne Holiday Homes we recommend paying slightly more for the unlimited rides! And don’t forget your 20ps for the little model trains. You can also enjoy a stroll around the five-acre lake nature spotting. 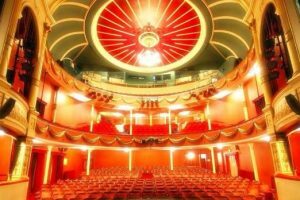 The oldest Theatre in Eastbourne with all the quirks of a traditional theatre. A wonderful hidden gem in the town with shows all summer long suitable for all ages- something for the whole family to do when renting one of our Eastbourne Holiday Homes. Ranked #1 on TripAdvisor Nigel Greaves’ Gallery is full to the brim of contemporary art from land and seascapes to figurative and abstract works. 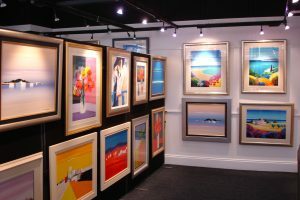 Pop in and have a look around and if anything catches your eye the artist himself will be happy to answer any questions with no pressure to buy anything, although you might just surprise yourself and end up the new owner of one of his pieces! 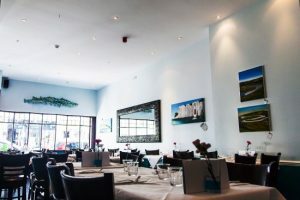 Gorgeous authentic Italian restaurant close to the seafront with a real personal touch. The seafood specials are not to be missed! Where possible they use local ingredients including local seafood. 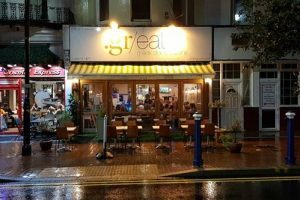 The restaurant bringing Greece to Eastbourne! Run by a couple on a mission to serve Greek food as good as it is in the sun. The meze offers the full tasting experience but be sure to book as it gets busy. Cru kitchen serves high quality, exciting dishes. They have tapas style small plates or larger plates for a more traditional dining experience. 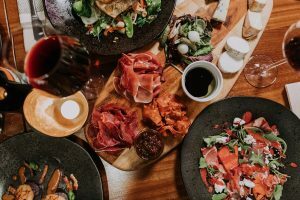 We recommend the cheese and charcuterie boards paired with a glass of your favourite wine! Ranked #1 on Tripadvisor The Green Almond is a vegetarian Bistro with a lunch buffet and set evening menu that changes monthly. Above and beyond your normal vegetarian meal in a friendly relaxed setting. Always book ahead. 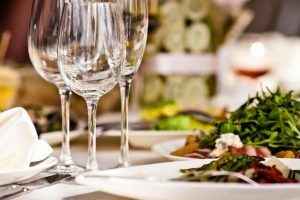 Perfect for a special occasion Morgans serves fantastic food at very reasonable prices. The central location make it a great spot to start your evening or end your day. 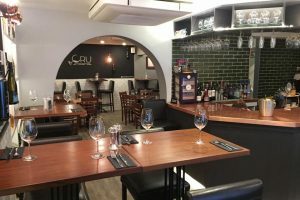 Cru wine bar has a huge collection of wines from around the world and have ‘The Cru Concept’ where you can buy some of the best wines available at retail price and pay corkage to enjoy them in the relaxed bar. Amazing place for any wine lover to work their way through the ‘by the glass’ options usually not available on such wines. The best coffee in town! Lovely independent coffee shop serving London roasted coffee and delicious cakes. Not far from the shopping centre so makes a great stop off when your feet get tired. Just 5 minutes from Eastbourne Pier The Marine is a truly traditional English pub with very English menu options including a Sunday roast. 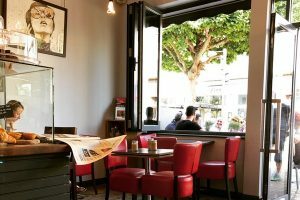 They have enough space for groups and are dog friendly too! 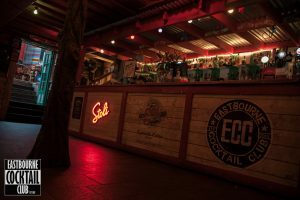 A one of a kind cocktail bar close to Eastbourne station. 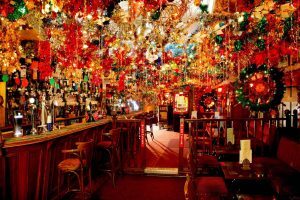 The bar is full of a mix of vivid artwork and rock ‘n’ roll memorabilia with a cocktail list longer than you could dream of. Check the website to see what’s on tonight! 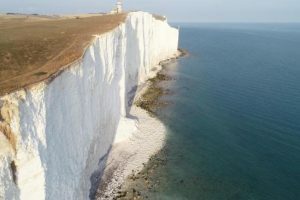 Eastbourne is just 44 miles south of the M25 via the M23 and A27, less than an hour from Gatwick Airport and 20 minutes from Newhaven ferry port. The A259 provides a scenic route from Dover and the Eurotunnel. There is a direct National Express coach from London Victoria Coach Station taking 3 hours 30 minutes. To get to one of our Eastbourne Holiday Homes there are direct services from London Victoria – 1 hour 12 minutes, Ashford International – 1 hour 9 minutes and Brighton – 33 minutes. Pre-booked Eastbourne station pick-ups from local taxi companies are available. The nearest major airport to Eastbourne is London Gatwick Airport which is only 47 miles away and 1 hour 6 minutes by car. Other nearby international airports include London Heathrow, 1 hour 47 minutes and London Stansted, 2 hours 3 minutes away. All three airports are also linked to Chichester by either train or National Express coach.